2,324 people read this post. Without doubt this duaa was accepted. They were then included in the choicest blessings of Allah mentioned in the aayat. On this basis they also included in the Ahlul Bayt. A question comes about: Who are the Ahlul Bayt? Literally: (The first purport of Ahlul Bayt is the wife. Thereafter the children and other family members etc.) Technically: (Banu Hashim and Banul Muttalib and the honourable wives). This is according to majority of the Ulama. The meaning of this Hadith is that whoever loves them loves Rasoolullah (Sallallahu Alayhi wa Sallam) and whoever dislikes them dislikes Rasoolullah (Sallallahu Alayhi wa Sallam). This was also regarding the Sahaabah in general. A question remains: What was the relationship between the Ahle Bayt and the other Sahabah especially the Khulafaa-e-Raashideen (Radiyallahu Anhum)? Based on this Aayat we understand the Sahaabah (Radiyallahu Anhum) had an excellent relationship amongst them. However we will further elucidate this by way of examples from the lives of Sahaabah (Radiyallahu Anhum). 1) The name given to a child is something very significant. The significance cannot be denied. One of the most significant aspects of the name of a person is that it shows the religion of a person. You will not find a Christian or Jew naming his child Muhammad. Similarly you will not find a Muslim naming his child David or John. The reason being that these have different religious connotations. Another significance of a name is that it shows affinity and love for the person after whom the child is named. The name is not chosen for political reasons. Nor will a person name his child after his enemy. He will choose a name which has a good menaing and significance and is liked by everybody. The same will apply to his grandchildren. He will not allow them to name their children after his enemies. This will apply to every generation. 2) Who would a person marry his beloved daughter – the apple of his eye – off to? Would he marry her off to a criminal or to the person who killed her mother or brother? Never. A person would be very particular and meticulous when it comes to choosing a husband for his daughter. He would never choose anybody who caused harm to him or his family. It would surely be a pious and righteous person. 3) A person would only praise and speak highly of those deserving of praise. He will never speak highly of his enemy or somebody he does not love or does not deserve any praise. Now let us look into the life of Sahaabah (Radiyallahu Anhum) to see the relationship between Ahle Bayt and the other Sahaabah. Let us see how strongly these aspects are found in their lives. Hazrat Ali (radiyallahu Anhu) named three of his sons after the first three Khulaafa-e-Raashideen. Abu Bakr bin Ali, Umar bin Ali and Uthman bin Ali. All three became Shaheed with their brother Hazrat Husain (Radiyallahu Anhu) in the Battle of Karbala. Similarly Hazrat Hasan (Radiyallahu Anhu) named three of his sons Abu Bakr bin Hasan, Umar bin Hasan and Talha bin Hasan. All three of them also became Shaheed in the Battle of Karbala. Hazrat Husain (Radiyallahu Anhu) named his son Umar bin Husain. Zainul Aabideen (Rahmatullahi Alayhi)- the grandson of Hazrat Husain (Radiyallahu Anhu) named his daughter Aaisha and his son Umar. This shows the excellent relationship between the Ahle Bayt and the other Sahaabah (Radiyallahu Anhum) in the first aspect. Let us look at their relationship in the second aspect. Hazrat Ali (Radiyallahu Anhu) married his daughter – the granddaughter of Nabi (Sallalalhu Alayhi wa Sallam) – Hazrat Umme Kulthoom (Radiyallahu Anha) to Hazrat Umar (Radiyallahu Anhu). The mother of Ja’far Saadiq – a descendant of Hazrat Husain (Radiyallahu Anhu) – was a descendant of Hazrat Abu Bakr (Radiyallahu Anhu) – his great granddaughter. This also shows the excellent relationship between the Sahaabah (Radiyallahu Anhum) and the Ahle-Bayt. Let us look at their relationship in the third aspect of praise for each other. From here we understand the excellent relationship between the Ahle Bayt and the other Sahaabah (Radiyallahu Anhum). May Allah Ta’ala grant us all taufeeq to honour and respect all the Sahaabah (Radiyallahu Anhum) and not be duped by any splinter groups. Ameen. Every page of history is a place of lesson for mankind. The ruthless martyrdom of Sayyidina Husayn (RA) the leader of the youth of Jannah, his family and his companions shall never be forgotten. Every Muslim perceives the pain of this tragedy in his heart. Many lessons are to be learnt from this tragic event. An unbroken chain of dissension began with the martyrdom of Uthman RA. Hypocrites plotted and schemed to sow division by using the emotion of simple minded Muslims. Sadly swords were brought into motion on both sides. With the death of Sayyiduna Ali (RA), the first and most notable phase in the history of Muslim people came to an end. All through this period it had been the Qur’an and the Sunnah which had guided the leaders and the led, set the standards of their moral conduct and inspired their actions. It was the time when the ruler and the ruled, the rich and the poor, the powerful and the weak, were uniformly subject to the Divine Law. After Sayyiduna Ali (RA), Muslims agreed to give the Khilafat to Sayyiduna Muawiya RA, the son of Abu Sufyan RA and father of Yazid. Muawiya RA tried to continue on the same way as the Rightly-Guided Caliphs, but he was ruling a different generation of people. It was a period of immense turmoil and dissension. Forty muslims from Kufah were sent to Muawiya (RA) informing him that he should appoint his son Yazid as the next leader and that he was the most suitable and able person to administrate the Islamic Empire. Initially Muwaiya RA was skeptical but after consultation and deliberation a decision was taken to appoint Yazid as the leader. Hence, Muawiya formally appointed his son Yazid as his successor. 2. To do what Abu bakr RA did – that is to present the name of a person who was neither family to Rasulullah (sallallahu alayhi wa sallam) nor his close relative and all Muslims were unanimous about his capabilities. 3. To adopt the stance of Umar RA whereby he left the matter to a council of six Sahabah (RA). They considered these to be the only three options available and were not prepared to accept anything else. Muawiya (RA) in his considered opinion pressed ahead with his decision. During the lifetime of Muawiya (RA) the people of Syria and Iraq accepted the pledge of Yazid. When others saw this they also accepted the pledge for the unity of the Ummaha nd to avoid dissension. However the people of Madinah,Husain RA, Abdullah ibn Zubair RA, remained steadfast in their rejection of the pledge and continued proclaiming the truth that Yazid was not capable for the post of Khilafah of the Muslims. This continued till Muawiya’s (RA) demise in Rajab 60 AH and Yazid became his successor. The moment Yazid came to power he demanded the oath of allegiance (bay’ah) from everyone. Paying allegiance was an Arab tradition which was carried out in important matters such as that of rulership and authority. Yazid’s message was delivered to Husayn (RA) as well but he did not comply. Acknowledging Yazid’s authority by the Prophet’s (sallallahu alayhi wasallam) grandson at this point would have meant acceptance of the Islamic leadership being mismanaged. For Yazid, Husain’s (RA) seal of approval was the one most needed. Yazid instructed the Governor of Madina Munawwarah, Walid to force Husayn ibn Ali (RA) to pledge allegiance. Husayn (RA) refused and uttered his famous words that “Anyone akin to me will never accept anyone akin to Yazid as a ruler.” Husayn (ra) left Madina Munawwarah for Makkah Mukarramah on Rajab 28, 60 AH, two days after Walid’s attempt to force him to submit to Yazid’s rule. He stayed in Makkah from the beginning of the Sha’ban and all of Ramadan, Shawwal, as well as Zul Qa’dah. It was in Ramadan 60 AH, and the people of Kufa were looking at Husayn (RA) for leadership. Soon there was a stream of letters coming in from Kufa urging him to challenge the leadership of Yazid ibn Mu’awiyah, and assuring him of their loyalty and allegiance. On certain days there would be as many as 600 letters, with messengers who enthusiastically described the support he would receive from the Kufans. Sayyidina Husayn (RA) decided to send his cousin Muslim ibn ‘Aqil to investigate the situation in Kufah. If he found it favourable he should write to inform Husayn (RA), who would depart with his family from Makkah to join him in Kufah. Muslim arrived in Dhul Qa’dah 60 AH. When the Kufans learnt of his arrival, they presented themselves to Muslim and gave their solemn pledge for Husayn (RA) with their lives and all they possessed. When this number rose to about 18 000, Muslim felt confident enough to dispatch a messenger to Husayn (RA) informing him of the bay’ah of the Kufans, and urging him to proceed from Makkah. Yazid ibn Muawiya replaced Nu’man ibn Bashir, the governor of Kufah with the ruthless ‘Ubaydullah ibn Ziyad who was regarded to be stern in confronting Husain RA. Muslim ibn Aqil who was residing secretly in the house of Hani ibn ‘Urwah realized that the hour for a decisive encounter had arrived. He gathered 4000 of the men who had given him their oath of allegiance and loyalty to Husayn (RA) and proceeded towards the governor’s fort. When Ibn Ziyad saw Muslim ibn ‘Aqil with the Kufans at his gate, he sent some of the tribal leaders of Kufa to speak with their people, draw them away from Muslim, and warn them of the wrath that would descend upon them when the armies from Damascus arrived. Soon mothers were telling their sons, “Come home, there are enough other people here,” and fathers ominously warning their sons, “What will happen tomorrow when the Syrian armies start arriving from Damascus? Gradually they all deserted Muslim ibn ‘Aqil under the gates of the governor’s fort. At sunset, he was left with only 30 men and before he knew it, he was all on his own in the streets of Kufa. Out of the 18 000 men who but days before placed their right hands in his, solemnly pledging allegiance to the cause for which they had invited the grandson of Rasulullah (sallallahu ‘alayhi wasallam), not a single one was there to offer Muslim ibn ‘Aqil the solace of their company. Eventually Muslim was captured from a house in which he sought refuge, and taken to Ibn Ziyad. Muslim knew his death was at hand. Tears flowed from his eyes, not at his own fate, but at the thought of Husayn (RA) and his family travelling through the harsh, merciless desert towards a fate much more harsher and merciless enemy firmly resolved to bring an end to his venture, and to the most treacherous of people who deserted him at the hour of need. Later that day – the Day of ‘Arafat, the 9th of Zul Hijjah – Muslim ibn ‘Aqil was taken up to the highest ramparts of the fort and executed. Upon the earlier messages and letters of invitation, Sayyiduna Husayn (RA) made earnest arrangements to travel to Kufa. At this point Husayn (RA) was not aware of the death of Muslim ibn Aqil and was acting on his letter indicating the situation in favour of coming to Kufa. Husayn (RA) sent a messenger, Qays ibn Mushir to inform the Kufans of his imminent arrival. This messenger was captured by Ibn Ziyad, who ordered him to mount the walls of the fort and publicly curse Husayn (RA) and his father. Instead he praised Sayyiduna ‘Ali (RA) and Sayyiduna Husayn (RA), telling them that Husayn (RA) was on his way, and exhorting them to assist him as they had promised. He ended his brief address by hurling curses on Ibn Ziyad. Upon the order of Ibn Ziyad, he was flung from the ramparts and killed. Despite this impassioned plea, the men of Kufa were unmoved. In Makkah, a number of the eminent Sahabah and children of Sahabah tried to dissuade Husayn (RA) from going to Kufah, or if he was determined to move, not to take women and children with him in this dangerous journey. He delivered a famous sermon in the Kaaba highlighting his reasons to leave, that he didn’t want the sanctity of Kaaba to be violated, since his opponents had crossed any norm of decency and were willing to violate all tenets of Islam. Husayn (RA) considered it a religious obligation and made a firm resolution for the cause of Allah to depart, although he had been apprised of the dangers that lay ahead. However, the importance of the matter compelled him to face the dangers. He set out from Makkah on the eve of Zul Hijjah 60 A.H, still unaware of the fate of Muslim ibn Aqil and Qays ibn Mushir. After an arduous journey of almost a month, his party neared Iraq. It was there that he first heard of the treachery of the Kufans and the death of Muslim ibn ‘Aqil and Qays ibn Mushir. Learning of this tragedy, many insisted on returning as there were no friends in Kufa, however the family of Muslim were determine to avenge his blood. Ultimately Husayn (RA) decided to go ahead. The caravan of Husayn (RA) and members of the Ahle Bayt reached Karbala on Muharram 2, 61 AH. They were forced to pitch a camp on the dry, bare land. Here, they were intercepted by the vanguard of Ibn Ziyad’s army; about 1000 men led by Hurr ibn Yazid. Husayn (RA) asked the army, “With us or against us?” They replied: “Of course against you!” Husayn (RA) said: “If you have changed your position from what I received from your letters and from your messengers then I will return to where I came from.” Their leader, Hurr, refused Husayn’s (RA) request to let him return to Madina Munawwarah and Hurr stationed his army nearby. Hurr said “I have not been ordered to fight you, I have been ordered not to separate from you until I send you to Kufa.” The two groups performed salaah together behind Husayn (RA). In this while Husayn (RA) also gave certain sermons reiterating the purpose for which they had set forth. Meanwhile Ibn Ziyad, governor of Kufa under Yazid placed Kufa under heavy surveillance. 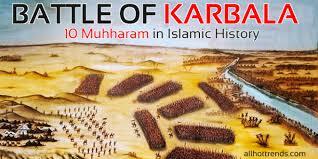 He dispatched a 4000 strong contingent under the command of ‘Umar ibn Sa’d to confront Husayn (RA). Ibn Ziyad commanded Umar ibn Sa’ad, “Prevent Husayn and his followers from accessing water and do not allow them a single drop.” Husayn (RA) was given only one choice – to give pledge on the hand of Yazid. Ibn Sa’ad followed the orders, and placed horsemen to blockade the Euphrates and all access to water. One of Husayn (RA) followers met Umar ibn Sa’ad and tried to negotiate some sort of access to water, but was denied. The water blockade continued up to the end of the battle on Muharram 10th. Husayn (RA) requested ibn Sa’ad to discuss the matter in the night and gave 3 choices, either they be allowed to return from where they came – he be given opportunity to sort the matter out with Yazid or send him to the border of a Muslim state where he will live a normal life. (Note some historians reject the second two options). When Ibn Ziyad was informed of this he was impressed and said this was an indication of someone who wants to obey the Ameer. However Shimmir Dil Joushan coaxed Ibn Ziyad not to be misled and warned him that Husayn will return stronger if he is let off. Ibn Ziyad accepted Shimmir’s advice and ordered to start the battle immediately and not to postpone it further. The army started advancing toward Husayn’s (RA) camp on the afternoon of Muharram 9th. At this point Husayn (RA) sent Abbas ibn Ali to ask Ibn Sa’ad to wait until the next morning, so that he and his men could spend the night praying. Ibn Sa’ad agreed to the respite. Seeing the reluctance of Umar ibn Sa’ad to commence the battle Ibn Ziyad sent the ruthless Shimmir Dil Joushan (his chief commander) to replace Umar ibn Sa’ad as the commander. Husayn (RA) was sitting in front of his tent, he felt sleepy and his eyes closed. He woke up upon hearing a sound. When his sister Zaynab RA heard the sound she enquired what was the matter. Husain (RA) told her he saw Rasulullah (sallallahu alayhi wa sallam) in his dream informing him that he was going to meet him soon. This was on the 9th of Muharram. Husayn (RA) gathered his men and told them that they were all free to leave the camp in the middle of the night, under cover of darkness, rather than face certain death if they stayed with him. None of them defected and they all remained with him. Husayn (RA) and his followers held a vigil and engaged in Salaah and dua all night. On Muharram 10th, Husayn ibn Ali (RA) completed the Fajr salaah with his companions. He appointed Zuhayr ibn Qayn to command the right flank of his army, Habib ibn Muzahir to command the left flank and his half-brother Abbas ibn Ali as the standard bearer. Husayn’s (RA) companions numbered 32 horsemen and 40 infantry. Husayn (RA) called the people around him to join him for the sake of Allah and to defend the Ahle Bayt. His speech affected Hurr ibn Yazid, who had stopped Husayn (RA) from his journey. He abandoned Umar ibn Sa’ad and joined Husayn (RA). Umar ibn Sa’ad advanced and fired an arrow at Husayn’s (RA) army, saying: “Give evidence before the governor that I was the first one to throw.” Ibn Sa’ad’s army started showering Husayn’s (RA) army with arrows. Very few men from Husayn’s army escaped from being shot by an arrow. Both sides began fighting ferociously. Successive assaults resulted in the death of a group of Husayn’s (RA) companions. Amr ibn Hajjaj attacked Husayn’s (RA) right wing, but the men were able to maintain their ground, kneeling down as they planted their lances. They were thus able to frighten the enemy’s horses. When the horsemen came back to charge at them again, Husayn’s (RA) men met them with their arrows, killing some of them and wounding others. Amr ibn Hajjaj kept saying the following to his men, “Fight those who abandoned their creed and who deserted the jama’ah!” Hearing this, Husayn (RA) said to him, “Woe unto you, O Amr! Are you really instigating people to fight me?! Are we really the ones who abandoned the creed while you yourself uphold it?! As soon as our souls part from our bodies, you will find out who is most worthy of entering the fire! In order to prevent random and indiscriminate showering of arrows on Husayn’s (RA) camp which had women and children in it, Husayn’s (RA) followers went out to single combats. Men like Burayr ibn Khudhayr, Muslim ibn Awsaja and Habib ibn Mazahir were slain in the fighting whilst attempting to shield Husayn (RA) from the enemy. Every casualty had a considerable effect on their military strength since they were vastly outnumbered by the enemy. Husayn’s (RA) companions were coming, one by one, to bid farewell to him, even in the midst of battle. After almost all of Husayn’s (RA) companions were killed, his relatives asked his permission to fight. The men of Banu Hashim, the clan of Nabi (sallallahu alayhi wasallam), went out one by one. Ali Akbar ibn Husain, the middle son of Husayn (RA), was the first one who received permission from his father. Casualties from Banu Hashim were sons of Ali ibn Abi Talib, sons of Hasan ibn Ali, a son of Husayn ibn Ali, a son of Abdullah ibn Ja’far ibn Abi-Talib and Zaynab bint Ali, sons of Aqeel ibn Abi Talib, as well as a son of Muslim ibn Aqeel. There were seventy two Hashimis martyred in all, including Husayn (RA). Abbas ibn Ali advanced towards the Euphrates for water. He continued his advance into the heart of ibn Sa’ad’s army. He was under heavy shower of arrows but was able to penetrate them and get to the water leaving heavy casualties from the enemy. He immediately started filling the water skin. In a remarkable gesture of loyalty to his brother and grandson of Rasulullah (sallallahu alayhi wasallam) he did not drink any water despite being severely thirsty. He put the water skin on his right shoulder and started riding back towards their tents. Umar ibn Sa’ad ordered an outright assault on Abbas ibn Ali saying that if Abbas ibn Ali succeeds in taking water back to his camp, we will not be able to defeat them till the end of time. A massive army of men blocked his way and surrounded him. He was ambushed from behind and his right arm was cut off. Abbas ibn Ali put the water skin on his left shoulder and continued his way but his left arm was also cut off. He now held the water skin with his teeth. The army of ibn Sa’ad started shooting arrows at him, one arrow hit the water skin and water poured out of it, now he turned his horse back towards the army and charge towards them but one arrow hit his eyes and one hit his head and he fell off the horse. In his last moments Abbas ibn Ali was wiping the blood in his eyes to enable him to see Husayn (RA). Inna lillahi wa inna ilayhi rajioon. Husayn (RA) was being protected by his loyal companions all along. The enemy attacked Husayn (RA) from all sides but was being repelled every time. At the time of Zuhr many of the companions of Husayn (RA) were martyred and the battle stopped for Salaah. The battle was ferocious and no one heeded his call – Zuhr Salaah wa seprformed in the manner of Salaatul Khauf. After Zuhr the enemy had reached Husayn (RA). They continuously attacked each other, until his numerous injuries caused him to rest for a moment. At this time he was hit on his forehead with a stone. He was cleaning blood from his face while he was hit on the chest with arrow and he said: “In the name of Allah, and by Allah, and on the Deen of the messenger of Allah.” Then he raised his head up and said: “Oh Allah! You know that they are killing a man who is the son of the daughter of your Prophet and on the earth today there is none except him.” He then grasped and pulled the arrow out of his chest, which caused heavy bleeding. He became very weak and stopped fighting. The soldiers approaching him gave up confrontation, seeing his position. The enemies hesitated to fight Husayn (RA), but they decided to surround him. At this time Abdullah ibn Hasan, an underage boy, escaped from the tents and ran to his uncle, Husayn (RA). When a soldier intended to slay Husayn (RA), Abdullah ibn Hasan defended his uncle with his arm, which was cut off. Husayn (RA) hugged Abdullah, but the boy was already hit by an arrow. Eventually the wretched Shimmir ibn Dhiljoushan took ten men and advanced towards Husayn (RA). In spite of his severe thirst and wounds Husayn (RA) continued fighting them. Historians have recorded this as an unparalleled incident. Here was a man whose children and family were all killed, he was severely injured, deprived of water, yet fighting so valiantly. When Shimmir ibn Dhiljoushan saw that every person was avoiding killing Husayn (RA) he called upon all the scoundrels to advance at once. In this manner the grandson of Muhammad (sallallahu alayhi wa sallam), the noblest person on earth at the time was martyred whist combating his oppressors. Inna lillahi wa inna ilayhi rajioon. Then Shimmir ibn Dhiljoushan told Khauli ibn Yazid to dismount his horse and severed Husayn’s (RA) head from his body. The army of Ibn Sa’ad rushed to loot the tents. The daughters of Rasulullah (sallahu alayhi wa sallam’s) family were expelled from the tents, unveiled and barefooted, while weeping and crying for their slain relatives. The army set all the tents on fire. The women were asking: “By Allah, will you make us pass the site of the murder of Husayn?” .When they saw the martyrs they cried profusely. Then Sakinah bint Husain embraced her father’s body until some people moved her away. Umar ibn Sa’ad called on some horsemen to trample Husayn’s (RA) body. The trampling and mutilating of the martyred continued till sunset. Umar ibn Sa’ad sent Husayn’s (RA) head to ibn Ziyad who ordered that the Mubarak head of Husayn (RA) should be placed on a stick and paraded in Kufa for all to see. During the journey from Karbala to Kufa, and from Kufa to Damascus, Husayn’s (RA) sister Zaynab bint Ali and Umm-Kulthoom bint Ali, and son Ali ibn Husain gave various speeches that exposed the truth and told the Muslim world of the various atrocities committed in Karbala. The Ahle bayt were held prisoners in Damascus for a year. During this year, some prisoners died of grief, most notably Sakina bint Husayn. The people of Damascus began to frequent the prison, and Zaynab and Ali ibn Husayn used the opportunity to further propagate the message of Husayn (RA) and explain to the people the reason for Husayn’s (RA) uprising. Historians have written that for two or three months after the gruesome martyrdom of Husayn (RA) the atmosphere was such that when the sun rose and sunlight fell on the walls, it was as if blood had envelope the walls. The news of martydom reached Madinah Munawwarah four days later – when calculated this dream was seen at precisely the time of the shahadat of Husayn (RA). Imam Tirmizi (rah) narrates from Salma RA that one day she went to visit Umme Salama RA, and found her crying. When asked the reason she said” I saw Rasulullah (sallallahu alayhi wa sallam) in a dream in such a state that his beard and hair was covered in dust. I asked him what the matter was. He replied that he was present at the martyrdom of Husayn (RA). Imam Zuhri (rah) states that of the people involved in the callous murder of Husayn (RA) not one was spared. Each one was punished in this world. Some were killed, became blind, faces blackened, some were burnt beyond recognition etc. This was not the actual punishment for their actions. It was merely an example of what is to come so it could serve as a lesson for people in this world. “I am inviting you to protect the book of Allah and the Sunnah of Rasulullah (sallallahu alayhi wa sallam) and to strive to implement Islamic law.” Husayn’s (RA) purpose and mission was for the sake of Allah and to oppose oppression and tyranny. 1. To promote the Quran and Sunnah in a correct manner. 5. To have full trust in Allah Ta’ala no matter how great the trial may be. O Allah grant us the ability to follow the lifestyle of Rasulullah (sallallahu alayhi wa sallam) His companions and his pure and Noble family. Aameen. Previous Is it necessary to purchase items on Ashura to attain reward in hadith?